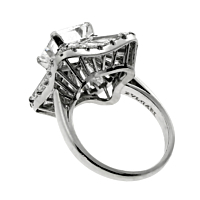 Bulgari has bestowed us with this Ballerina style diamond engagement ring featuring a massive 2.80ct Vvs2 F Color Square Emerald Cut Diamond, flanked with 4.00ct appx of glittering baguettes. 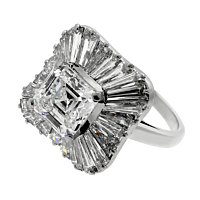 This ring has all the brilliance to make her say YES! Fit for royalty, this will make bring pleasure for years to come.